I recently purchased myself a couple of ”Ddung” dolls from eBay, and although I am unsure (and honestly quite doubtful, given the price I paid) whether my ”Ddung” dolls are real Ddung dolls, I did fall in love with the style and design of them and started learning more about them. What is a Ddung Doll? Ddung is a 4 year old little girl, designed by the Korean design team Seol, who have also designed characters such as Najju, Miss Aileen and Little Alley. 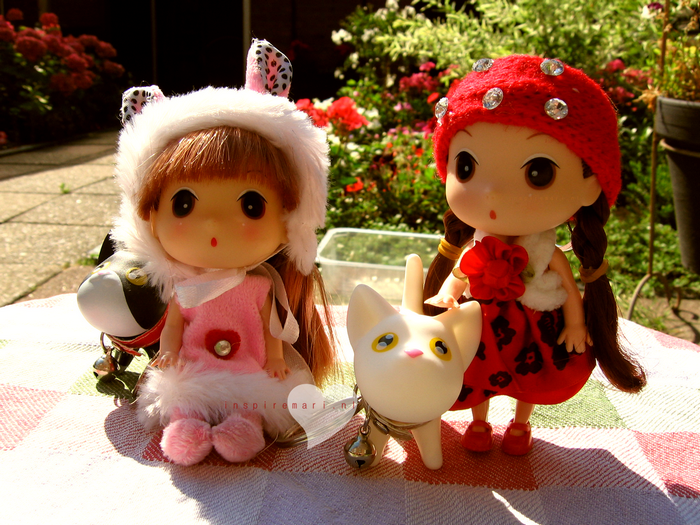 The Ddung dolls, however, launched back in 2002, has been the most popular amongst these. Overseas, the Ddung dolls do not seem to be very well known. Ddung dolls come in various shapes and sizes, which all look very cute of course. It’s mostly girl dolls, but Ddungs little boyfriend Bong-gu has also been turned into a collectible doll. The Ddung line has expanded to items besides collectible dolls. Apart from clothing for the dolls, things like cleansing creams and tissues, baby wipes, clothes, play sets, body lotions, umbrellas, cups, bags – you name it – have also been designed. So if you’re looking for a cute collectible doll, try the Ddung doll from Korea!